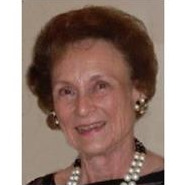 Joanne E. Shields, 83, died in hospice after a brief illness. A native of Kansas City, Kansas, Joanne attended Wyandotte High School. After graduation she started work at Sealright where she met Jim, who became her husband of 64 years and the love of her life. After her two daughters Elizabeth ad Jamie reached school-age she returned to work, first for Johnson County Mental Health Association, then for doctors in the mental health field. Joanne showed compassion and understanding for many youths and adults who came through the doors. She later worked for Price Brothers Management where her organizational skills, attention to detail and love of people really came into play. At Orman’s Furniture she loved sharing her sense of style and interior design. Her final position before retirement was office manager for Craig Wolfe Solar Design and Construction where her son-in-law valued her efficient organization, thorough attention to detail, interior design and people skills. Nothing was more important to Joanne than her family. She created a warm, inviting home where she was always willing to offer good advice, companionship or host an impromptu event for family or friends. As adults, her daughters called her every day and she always made time to chat—she was their best friend. Joanne shared great love and respect for her brother Tim, her sons-in-law Bill and Craig and her grand-son-in-law Joshua. She was a surrogate mom to many of her daughters’ friends as well—they often came by just to talk to Joanne and spend time with her. She was the life of the party and was also known to have many “sweet treats” available upon request. It wasn’t uncommon for her to have several cakes, batches of cookies or brownies ready to serve to family and friends. Lessons she passed on to her family included always making time for family, staying in the moment and showing love, kindness and acceptance to all. Joanne enjoyed time spent with family and friends in a variety of activities, including bowling, square dancing and playing cards. She volunteered with Silver Blades Figure Skating Club, supporting her daughters’ skating while assisting with many ice shows and competitions. She was the first competition chair for Heart of America, an annual event still being held today. For many years she volunteered as a classroom aid in her daughter’s classroom at Benninghoven and Comanche Elementary Schools; Joanne passed her own love of reading on to many children. Throughout her life, Joanne emphasized the importance of education, supporting and encouraging her daughters in all their efforts. Her daughters will remember and value the lessons learned from their mom including having a strong work ethic, dedication, perseverance, and cooperation with others. Joanne had a very special relationship with her granddaughter Angela whom she helped care for when Angela’s mother returned to work. That close bond continued as Angela grew up. Joanne travelled to several Odyssey of the Mind and musical competitions that Angela participated in. She never missed one of Angela’s theatrical productions, band concerts or symphony performances—she was Angela’s number one fan. Joanne served as a chaperone on a high school trip to England with her daughter and granddaughter. They spent many happy hours hanging out together: baking, laughing and creating many projects. Angela honored her grandmother by getting married in her grandmother’s wedding dress and naming her first child Joanna Elizabeth after her grandmother. Joanne loved to travel with her family and spent several years being a “snowbird” in Florida for part of each winter. She enjoyed traveling to art shows, meeting artists and watching them create their work. Her Celebration of Life will be held on April 18 at 2:00 PM with dessert reception following at Porter Funeral Homes, 8535 Monrovia, Lenexa, KS 66215. Joanne is survived by her husband Jim, brother Tim, brother-in-law Don, daughters Elizabeth (William) and Jamie (Craig), granddaughter Angela (Joshua) and great granddaughter Joanna Elizabeth. The family requests that memorial contributions be made to Kansas City Hospice House, www.kchospice.org. Our thoughts with the family. We watched a lot of growing years.